The CND AWOS (Automatic Weather Observation System) utilizes the features of the Vaisala WXT520 Weather Transmitter to provide a low cost and low maintenance Airport weather reporting system. The WXT520 provides Wind Direction, Wind Speed, Temperature, Pressure, Humidity, Rain and Hail readings from a single integrated unit and is connected to the CND ATIS Servers up to 2000 feet away via RS422 serial cable. 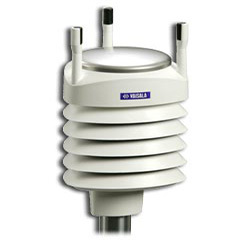 The system is supplied with a 10 Meter Stainless Steel self supporting mast and lightning rod. Data from the WXT520 is automatically included into ATIS broadcasts. East West Infiniti (P) Ltd.